Way up north. Sweden. : Slow week. It`s been a slow week, even though I got of work at 14,30 this week I haven't had the energy to much of anything. Well I spent time with the kids, baked a blueberry pie, did a little bit of cross stitch, but nothing big. I guess it`s needed sometimes to just be, I`m just not any good at it, I just feel sort of useless when I`m not making something, like I`m wasting all that time and not leaving any marks at all. I started a new project today though, I`m making a quilt each for my kids, I plan to give them as Christmas presents. I know they`ll like having a quilt each thats just theirs so it`s a good idea I think. I also get to use some of my more colorful fabrics for this, I have some thats just been hanging out for a bit to long now. 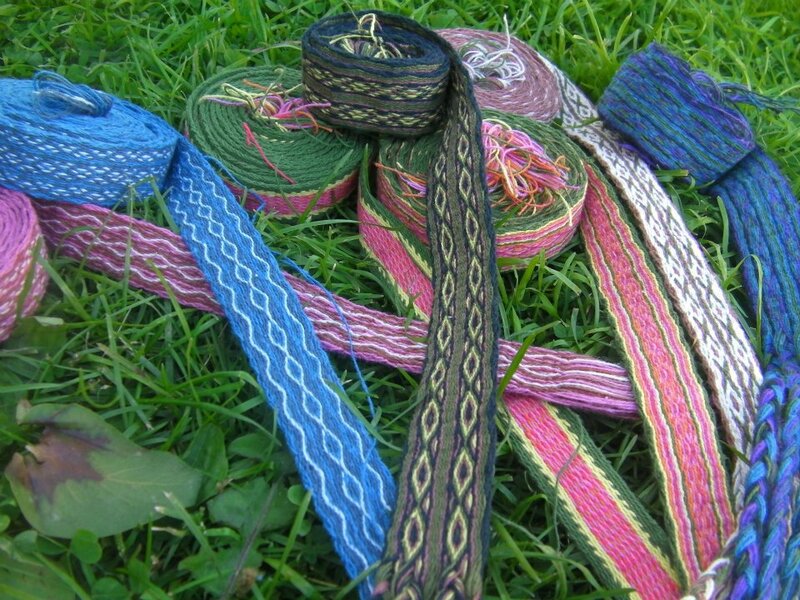 The picture is of some ribbons I`ve made. I have been really in to tablet weaving for about a year now, it`s just so much fun. I sort of lost it this summer though and I don`t feel any urge to start it again, I guess it will come back to med later. For now the quilting will keep me happy. Oh yes I almost forgot, I went all hero at work today. A couple of kids stepped in to a wasp`s nest and there where wasps everywhere, angry little tings to, the kids were screaming and crying so I had to run down and carry three of them out of there. Two kids got stung, and me to. It was sort of scary to cause I`m used to just waving them of but these wasps were of course angry as all hell so they just kept coming back.